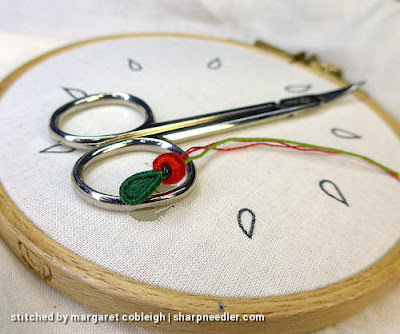 The Embroiderers' Guild of America (EGA) has a selection of small bite-sized embroidery designs called Petite Projects. 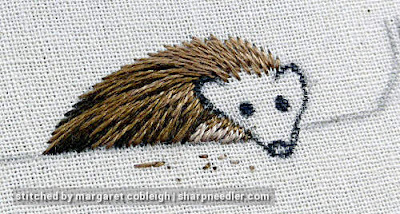 Available to all EGA members for free, these small projects are a nice, gentle way to introduce new embroidery techniques. My local EGA chapter, Muchas Manos de San Diego, has been teaching some of these projects at our monthly meetings. I was asked earlier this year if I would consider teaching one for stumpwork. I mulled it over for a while and decided to give it a whirl. 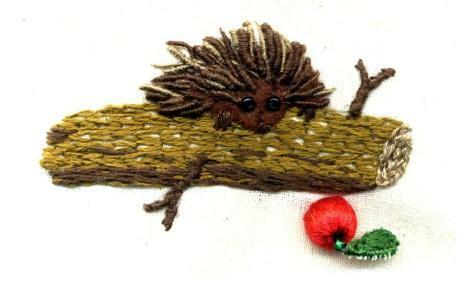 It's a hedgehog peeking over a log at an 'apple'. I don't about you all, but if that's an apple, that's one huge hedgehog and his name must be Spiny Norman! I've decided the apple is more like a berry because the implications of a giant hedgehog aren't something I want to contemplate! The first thing I changed was the hedgehog. I wanted to see him lightened up. I also wasn't thrilled by the bead-y eyes. They scare me a little bit, like the 'hog is chemically enhanced or something. I also decided not to stitch its body with bullions. Yeah, that's a lot of changes! The project is stitched on muslin (two pieces of fabric for the 'hog and one piece for the detached leaf). It is primarily embroidered with one strand of DMC cotton floss. Since I had to figure this design out as I stitched it, especially colour-wise, it was not worked in the proper order. Normally, you embroider back elements to front elements. 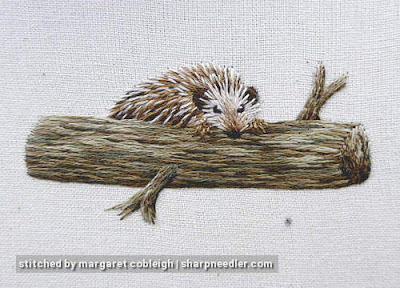 I had to stitch the hedgehog first to see if he would 'work'. Then I worked on the log to see how it would look, etc. It turned out OK, but I can see places where the embroidery would look better if I'd been able to stitch in the correct order. 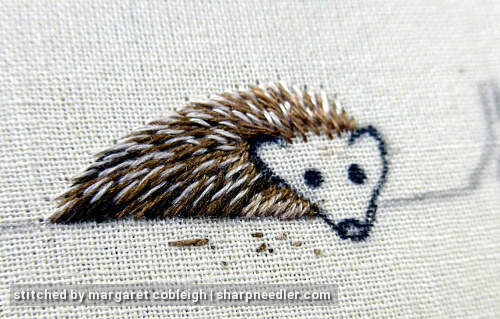 The little 'hog was embroidered with warm browns. In order to create some contrast, I stitched the log with dull and greeny browns. It's fun to stitch bark because it's very flexible. 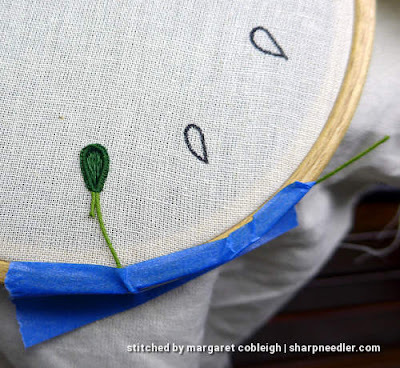 You don't necessarily have to follow the normal 'rules' of thread painting such as never, ever stitching down into an existing stitch. With bark, as long as you mind your stitch direction, the shading can be informal and very sketchy. The only stumpwork-y things about this project are the 'apple' and leaf. They are an easy introduction to detached elements. 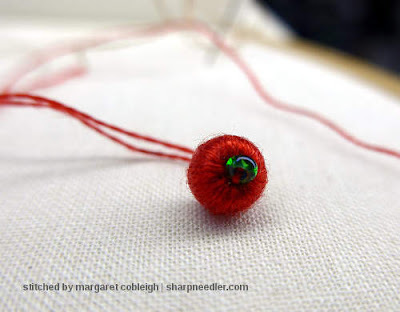 The berry is created by wrapping a bead with thread and the leaf is stitched to wire, then cut out and applied to the finished piece through the wrapped bead. The stitching instructions for the leaf were different from the way I was taught to do detached elements by both Jane Nicholas and Alison Cole. I believe the instructions say to satin stitch over the top of the wire and I decided to stick with Jane and Alison and stitch the leaf the way I've been taught. I couched the wire down, buttonhole-stitched over the rest of the wire, and finished by filling the interior of the shape with long and short stitches (really a bunch of straight stitches). Blue painters' tape was used to keep the wire tail out of the way while I was stitching. 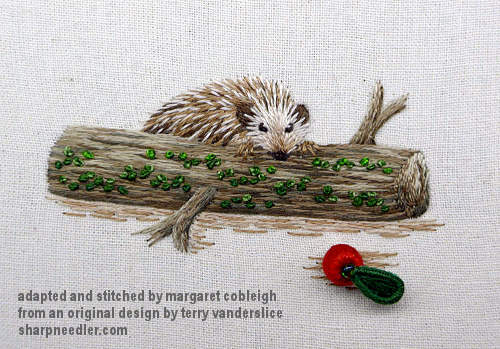 In order to add a little more colour and to balance out the pop of the berry and leaf, a bit of moss in the form of French knots (two strands, one wrap) was added to the log. The finished version is a little different from the original. He's a tiny little thing; the log is just under 2.5 inches (6.35 cm) wide. There's only one thing left to say: Dinsdale! I like your interpretation MUCH better than the original! Such lovely workmanship! Oh, this is adorable! A chemically enhanced hedgehog :)... You really made the design work much better than the original one. This is so much more natural and less cartoon-like. I would love to join your workshop! We'd love to have you join us, but I think the commute would be a bit difficult! I love it. He looks so much more real... thanks for sharing. SO CUTE!!! I must try it. Thank you. Adorable! Makes me want to learn how! Like others, I much prefer your hedgehog! Much cuter and not a tad freaky like the original 😊 Good luck with the class, I’m sure it will be a success! Very cute little project! I like the detail on the log and how it contrasts with the hedgehog. Beading Koma: What a Great Tool!